Live Tweets from today's awesome tour. Over at m.30boxes.com they've got a neat little service called Twapper - "Twitter Mobile for WAP". I didn't think much of it until just now when I realized that I only twittered a few times today, but John and Chris wrote several texts. I was even quoted in one of them! Twapper is so easy you can use it from your cell phone, but it makes a great deal of sense as a web service as well. Think, I wanted to see tweets from just a few users, not all my friends, not just me. No special #tagging or @addressing needed, just a good service. 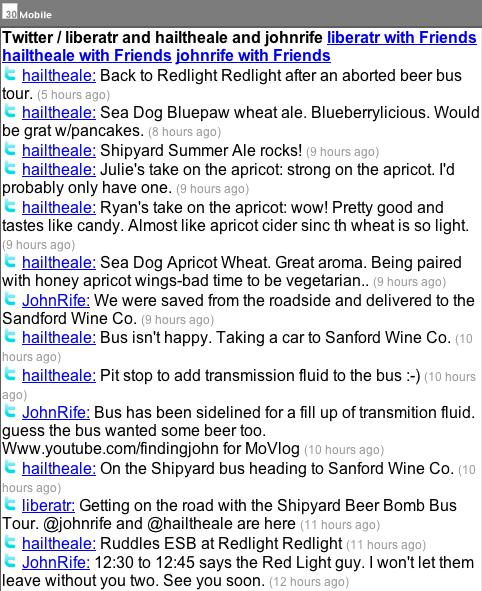 If you want to see more than one stream, just type +bloggingfringe or +johnrife+hailtheale to the end of your URL. I think it has a limit on the number of streams you can combine, but it is ad-hoc groups! Ad-hoc! Buzzword compliant! Another very useful thing that was omitted from this screenshot (for archival purposes) is a little text box just below the stream that bears the legend "Direct twitter this group only!" That's a very useful feature, so easy you can operate it from your crappy cellphone browser. Also, John was inspired to try out some live YouTube as per my suggestion at Friday's lunch, so check out that link too.